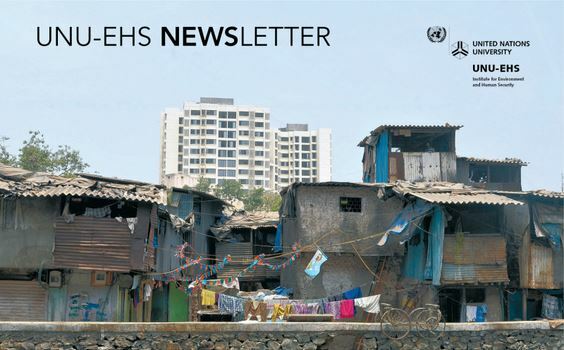 Welcome to the second edition of the quarterly UNU-EHS e-Newsletter. As we are moving into the busy fall season, there are multiple important processes that we are working hard on that deserve special mentioning. The Sendai Framework for Disaster Risk Reduction adopted by UN Member States on 18 March 2015 in Japan, is the first major agreement of the Post-2015 development agenda, and has fundamental implications for our work. It replaces the so-called Hyogo Framework for Action 2005-2015. From Hyogo to Sendai there is clear progress in two respects. First, there is more emphasis on what people call “output”, namely the reduction of the number of people harmed, instead of “input” in terms of the numbers of agreements and plans. Second, preparedness, in addition to pure intervention during a crisis has received a stronger weight. We should not conceal however that there are also problematic sides. Little progress has been made on the so-called underlying factors for risk, such as hunger and conflict, which have received less attention in the new framework. It will be of utmost importance that governments do not relent in their efforts to address these factors as well. From 25-27 September over 100 Heads of State and Government will attend the UN Sustainable Development Summit in New York. At the summit, they will adopt an ambitious, bold and universal sustainable development agenda that will end poverty and promote prosperity by 2030 while addressing the environment. The summit outcome document, entitled “Transforming our World: The 2030 Agenda for Sustainable Development,” was agreed on by the 193 Member States of the United Nations, and includes 17 Sustainable Development Goals. Science will be needed in many ways in the coming year, especially in formulating and improving indicators for assessment procedures and measuring progress in the implementation of the goals. The Bonn Climate Change conference in June took place in the newly opened World Conference Center across from the UN Campus. The new conference centre offers the UN unparalleled opportunities to host large and important events within walking distance of the offices and it further underlines the importance of Bonn as a UN city. The students of our Joint Master Course with the University of Bonn also had the special opportunity to participate in part of the conference and experience the international negotiation processes. I would also like to give a warm welcome back to our colleague Dr. Fabrice Renaud who has just completed a two-year assignment with our partner institution the Indonesian Institute of Sciences (LIPI) in Jakarta, Indonesia. In Jakarta, he worked hand in hand with local partners, ministries and students. His stay in Indonesia was instrumental in strengthening our research ties to LIPI and other partners in South-East Asia, where UNU-EHS has been present since 2005. The first cohort of our students from the Joint Master course “The geography of environmental risks and human security” with the University of Bonn is currently finalizing their Master’s theses and is expected to graduate by the end of the year. The new student intake in October will consist of an international mix of students from around the world and we are excited to host them at UNU-EHS for their orientation week. I hope you enjoyed reading the newsletter and also please follow our updates on our Twitter and Facebook page.